I've often heard people say on the path, "I don't know who I am any more!" It's indicative that you're starting to move beyond the false self ego and into the sense of 'no self'. It can be pretty scary and unsettling at first, and as it arises, fear might bounce you back into ego again. But there'll come a point, when you realise everything that you thought you were was false and an illusion anyway. And that such contracted identity doesn't serve anymore. This is when absolute freedom beckons. Rather than losing anything, you're starting to gain the whole Universe. Take a few moments. Stop what you're doing. Breathe and settle. Take a look out into the world, what do you see? Objects probably - the things in life that we relate to.... the solid things in your room, or in nature; people, friends, family and colleagues perhaps. There is relationship to these things: each carries a 'value', a meaning, they have a position in your landscape. But when you have some kind of fixed relationship to these things, then paradoxically, you fix yourself to them, as a point identity source. These are value judgments that then define you in time and space by them. Over time, this relationship with reality weaves all manner of threads and interconnections, and you become a name, a label, in relation to them....father, mother, sister, brother, friend, colleague. It further fixes and identitfies you, in your own psyche. It's all an illusion! You've fixed yourself in the constantly and shifting space-time-continuum. Your soul is not meant to be so tethered, and eventually, the shifting tides of the Universe will pull apart that identity anyway. So why wait? Why suffer? Why not unwind the sense of separated and fixed identity right now? There often comes a fear with this, "I'll lose myself". But really, you only lose the falsehood. In fact as you become so immersed in the all of it, you don't lose a thing, you only gain. You're no longer separated from the apple, instead you can taste the fullness of it, as if, in that moment, you are it. Breathe the air and it feels like you become it. Pause. Be still. Breathe. Take every thought that arises, every feeling and emotion, then trace them back inwards to what precedes them, to the source of them. Touch the emptiness from which they arose. Now look out into the world, and focus on an object - anything, a tree perhaps. Without moving the focus, look at how much you can see in the periphery around the tree - how much of the panorama can you see above, below, left and right? So let your focus expand out to embrace all of it without contracting down. Now walk forwards into this landscape. You start to feel less like a point source, and more like a moving flow of energy. You start to become the movement. The freedom of simply becoming present is beckoning in this Great 5D Shift. To progressively let go of control. To unwind the labels, to unpack the identity. To let the complete autenticity of your soul emerge. It's a wave of the moment, which then delivers you all the way back to the welcome shores of the One, inside of you. And when you get there, don't worry if you now don't know who you are. Because who you are arises and defines itself in the moment, just like the wave washing up onto the beach, before dissolving again back into the ocean. Although bearing resemblence to each previous one, every wave of experience is totally unique. And so are the arising waves of your soul, each totally unique, each totally spontaneous in the moment. What liberation, what freedom! It's time to become this freedom. To explode the myth of identity. To unleash unbounded liberation of being. Begin it now. Challenge every tether, every limitation, every tightness that fixes you in the illusion. Your immaculate home coming awaits! What does the sense of 'no-self' feel like? I am not with you. lol. The first thing my mind attached to with a big smile. (there's no one here) Open , watching the video even though it has 180000 views you can feel the energy and merge with it. I feel that same energy when I think or visit openhand. Some times it energy going out, some times it energy coming in and some times it is a feeling of the energy becoming one. WOW. it has come to my awareness that so many things which defined "me" no longer have importance , and that I am becoming distant from the attachments and sense of self / ego I had known for so long . with it has come a sense of calmness which had been missing for a long time. I feel the next few weeks in australia will play a big part in letting go too , exciting and also a little daunting to what parts of the ego still remain..
Its also interesting that there are peer-reviewed academic journal papers in Sociology dedicated to the exploration of the self as merely being a social construction, hence an illusion. Many intellectually 'enlightened' people there but without the experience itself. Still, the truth is recognised and accepted till it is fully realised and then it becomes the next chapter of one's life's expression and a deeper aspect of awakening. HI there Open. I am also in Sydney but 17,029 km from where you are. Wow the miles we cover without leaving the farm. Open when you were in Halifax and you ask, how do you feel? I had said, everything and nothing. this video is what the small "i" was talking about. Thank you again Open for being "nothing". PS. The prefect way to experience nothing, (Be Open) to it. It's a challenge for sure. And at the same time, it's entirely natural - like falling off a log. It's about letting go into it. The nature of ego is to control reality to get some kind of preferred outcome or experience - to receive love or not feel alone for example. And even as the realisation dawns that this doesn't serve, still there can be subconscious ties binding into identity and therefore polarity, which removes the sense of presence - of no self. That's why it doesn't work to aim for presence, because firstly it can be to deny what is already being experienced. Secondly, the very intention itself already confirms internal separation from presence. So it's a conundrum! The Openhand Aproach is to realise the nature of the relationship between Soul and Presence: when there is presence, then soul naturally flows from it without efforting. It just arises, mirroring the bigbang experience that flowed from presence to create the known Universe - it just happened. So here's the key: align with the soul, and presence will naturally start to happen due to the interrelation with presence. 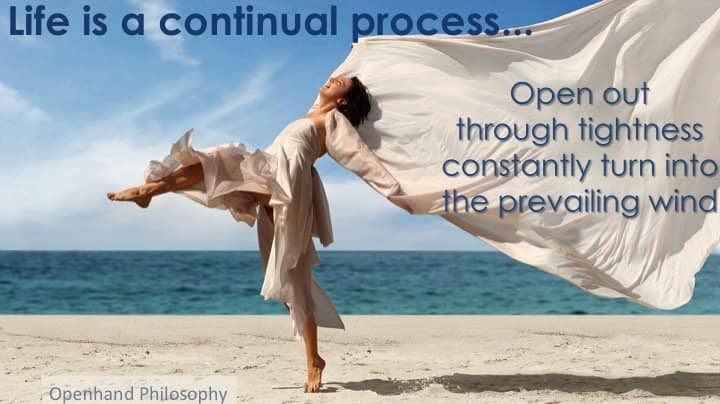 Learn how to connect with the rightness of soul in any given moment and to breakthrough into this authenticity by processing through any resistance or tightness - where the soul is being denied, because that's when presence is also being denied. How does that relate to your experience? What stood out for me was the word 'Conondrum' . That's the word I used when writing my diary. I am having some very disorienting Kundalini experiences these days ,some of them seem to be triggered by a soul mate who in 3D is a colleague at work. All this in the backdrop of a hectic ICU where we have been collaborating trying to literally save the lives of two little girls on the ventilator. We are looking Death in the eye. The six year old is better ,the eight year old may or may not make it. For some reason it's important I write their ages . I wrote today how my ego prefers to form a narrative ,a story and interact with that rather than the real and raw emotions and sensations I am feeling. My soul is multidimensional. My small I would like to linearize it to make it palatable . To attenuate the emotions somehow. The conundrum internally is to feel I to the emotions not to my interpretation . It's a glorious paradox . To feel into pure Presence ,I imagine would involve feeling into the tumult present right now ,first . Being on the edge of life and death that way can surely bring people right into the truth of the moment, likewise it can terrorise if we allow the fear or resistance to take over. ego prefers to form a narrative ,a story and interact with that rather than the real and raw emotions and sensations I am feeling. That's it. In unenlightened states, you're constantly forming judgments of the moment, creating narratives which then create barriers to the truth. It's this separation that creates small "I" identity that can then be victimised by the twist and turn of events. I loved that video Open ! How she feels at the end of that cold swim is how I feel after a 12-14 hour shift. Staring at numbers.In the present. When I go home I have to literally drop attachment to what is happening in hospital. The story of this child and that family. It's hard . And some days I am less attached than others. Somedays I need to cry just to be able to function. I constantly need to read about diseases,to learn more. Emotionally I have to handle my own reactions and interact with a grieving family who are sometimes aggressive as well. But it makes me a 1000 times more aliveness than anything else I can imagine doing. I love it so much ! The no-self has been a process of unfolding deep layers organically. It hasn't involved anything outside of myself. No "getting" somewhere. It has been a lengthy process. I have been in it for a year. Although the ego mind might see it as doing nothing, nothing is happening. I see this state of presence, of being is a lot of internal work and shifting that is not projected on the outside external but on the inside internal. Linear structures have completely fallen away. In other words, there are no more processes and procedures for getting somewhere. No more trying to acheive anything. Hi Tracy - indeed yes, it's turning inwards and constantly working through new layers. Then to add to that, it becomes about allowing this internal journey of unfolding reflect into the outer - the outer shapes from the inner. The two become seamlessly connected as you step into Enlightenment. And I agree - "no more proceedures for getting somewhere". 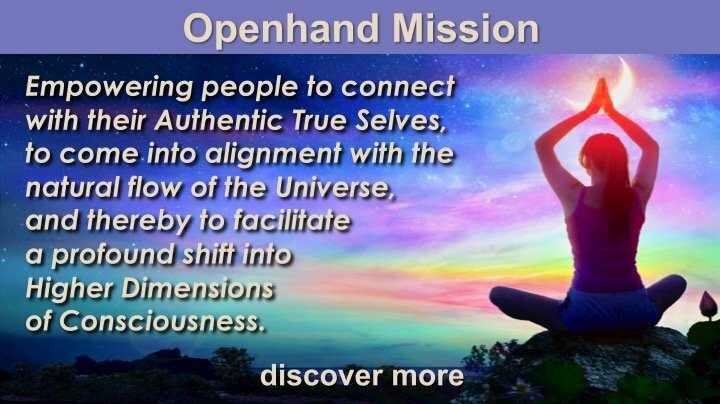 An Exploration of The Openhand Approach... "Openway"
The articles explaining kundalini and loss of sense of self have been a great help. I often feel weird and can now understand what is causing it. It can all change in a moment too. Also I found that where I would have felt fear I no longer do and using your instruction to go into fear where it arises has an amazing effect ...kundalini again arising. Great to hear Heather - keep working at it, Kundalini can take some considerable time to fully activate and integrate.